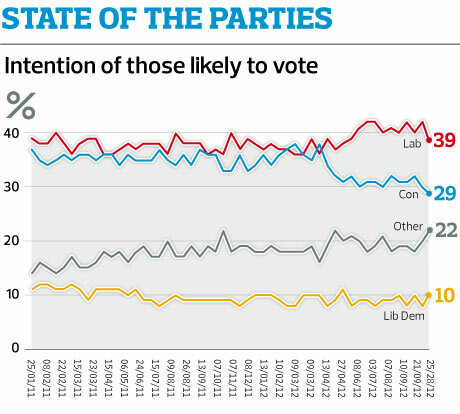 When polling organisations conduct political party voting intention opinion polls, usually commissioned by a newspaper, the story is always of how the three main (perhaps that should be two now) parties are faring, and which leader has the best approval ratings. The polls have been pretty consistent over recent months, showing Labour with a double digit lead over the Conservatives, and the poor old Lib Dems flat lining at around 10%, sometimes as low as 8%. But if you look more closely, the ‘others’ are doing surprisingly well. The ‘story’ will only mention this in passing, but if you look at the full results, as political anoraks like me do, there is something happening, which is much more of a ‘story’ than that put out by the commissioning media outfits. What you see is an impressive (around 10%) showing for UKIP, sometimes beating the Lib Dems into fourth place, and an improvement in the Green party share, which is around 3 or 4%. 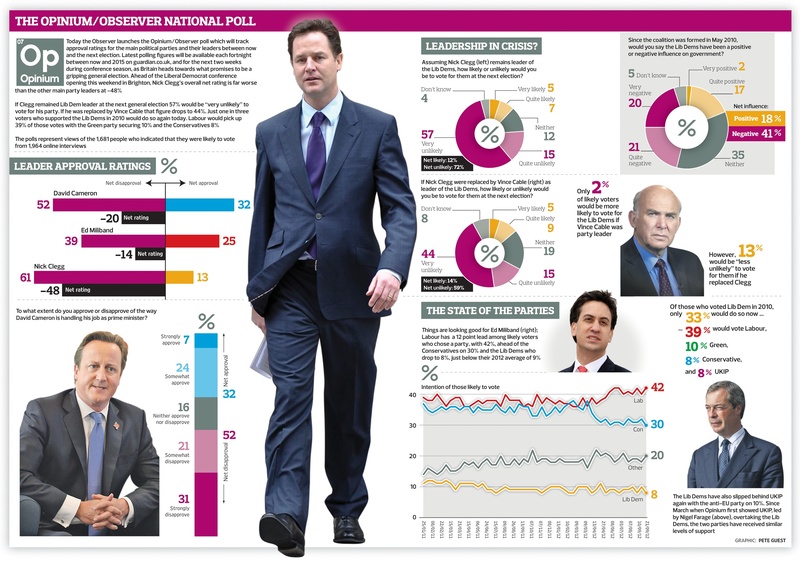 An example is this recent Opinium poll commission by The Observer newspaper. Now, that may not sound all that notable, but from my observations over the years, the Green party normally polls about 1 to 2% in national polls, except when there is an election (proportional) coming up like the European Parliament elections, when I’ve seen us poll as high as 6 or 7%. This is a trend which I reported on this blog here back in May, and recent opinion polls do seem to confirm this view. But why is this happening? I think the reasons are varied to some extent. Labour, Tory and Lib Dems all offer very similar policies these days, for one thing. The MP’s expenses scandal still resonates amongst the public too, and it is the main parties MP’s that were involved in this fraudulent raid on the public purse. But I think the main reason is a desire amongst the voters to ‘protest’ vote, “sod the lot of you” type of thing. What has changed on the party political landscape in recent years is that the Lib Dems are no longer the beneficiaries of this desire to stick it up the political establishment. They are of course in government now, though you would hardly know it with the Tories dominating the coalition government’s policies. Another opinion poll from Opinum sheds some light on this particular theory. Take a look at this graphic (right hand side). 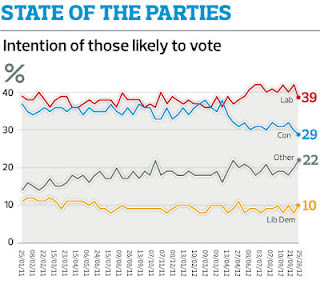 Of those who voted Lib Dem in the 2010 general election, only a third are intending to vote Lib Dem again, with Labour gaining the most (39%) of those who have changed their allegiance but 8% have switched to UKIP and 10% to the Green party. I find the idea that voters can switch from the most pro-European of the British political parties (Lib Dems) to UKIP whose whole raison d’etre is being anti-Europe, somewhat bemusing, but there you go. The 10% planning to vote Green is what has doubled our opinion poll score, which is a significant advance for us Greens, if not signalling some kind of major breakthrough. But it also means that we have much work to do, if we are to translate this into seats at Westminster and elsewhere. These voters are on the left politically, and so are our natural supporters. Put simply, we have to get more of those 39% of former Lib Dem voters that are intending to vote Labour next time, to vote Green. Which is why we need to go on the attack, and expose Labour for what it is, a ‘Tory light’ party, sometimes not even so light. Good post Mike. I agree about it being difficult to understand how Lib Dem voters can turn to UKIP! Maybe they were anti-Europe anyway but for some reason liked the other Lib Dem policies more, such as they are/were. Aye. Folk bang on about the dangers of splitting the left vote but, with a few honourable exceptions (Corbyn, McDonnell, Hopkins et al) a Labour vote ain't a left vote. The Greens, and to a lesser extent TUSC, should be making more of this. The Tory conference gives us a great opportunity to highlight the thinness of the Rizla 'twixt Labour & Tory policy. Maude's imminent attack on Civil Service facility time is one example (I'm a PCS rep so that's a subject close to my heart!) but next week will be littered with them.